How many times after drinking a good bottle of wine didn’t you think you should make a note of this wine to remember its name and buy it again? By the time you find a piece of paper and a pen you already thought of something more important or urgent to do and you forget. How frustrating when you look for your next bottle of wine and the name of this great wine escapes you! 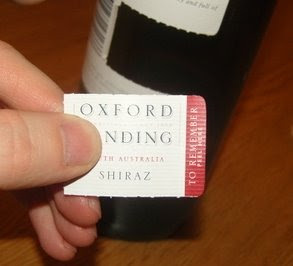 That’s why I loved the post of thedieline.com blog on an innovative packaging: a tear-off tab to retain all the useful bits of information about the wine. It can be put on the back label to keep a pretty front label. One more word about thedieline.com blog: it is a very interesting site on packaging in every industry with a strong section on the wine, spirits and beverage industry. A site to keep in mind! Second label, bulk wine or new brand? I’ve seen these used before – but the only one I remember off the top of my head is Graham Beck (from South Africa). Very good idea, but still there is a big step required to dig it out, get to the computer and find the site, however, better than simply forgetting. Evelyne Resnick's book, Wine Brands, (Palgrave McMillan) is now available worldwide. New Bordeaux The latest happenings in Bordeaux wine, from wine writer and Bordeaux resident Jane Anson. For over a decade, Resmo has created the Web presence and managed e-communications for prestigious European wine estates, Champagne houses and international brands. We work closely with their inhouse staff to present their products and services in the most attractive light that is also most accessible to the local culture of the target audience.